Currently in Beta Testing: The add-on is available for beta testing from the pre-release channel (PRC) within your Event Espresso account page. Once you’ve signed up for the PRC, the download will be available in the EE4 tab of the PRC. Github.com users can download the add-on from our Github page (under the name “eea-automated-upcoming-event-notifications”). Please note that you might have to manually update the plugin when we roll out the full version of the add-on. The Automated Upcoming Event Notification add-on will allow you to send a reminder email to your attendees about an upcoming event automatically. This can be used as a courtesy reminder to your guests about upcoming events and you can also customize this on a per-event basis. For example, you can automatically notify attendees/registrants three days before the start of one of your events. This add-on requires Event Espresso 4.9.39.p or newer. It cannot be used with old versions of Event Espresso 4. Download the current version of the Automated Upcoming Event Notification add-on for Event Espresso 4 from your Event Espresso account. You will not see any new WordPress administration menus for the add-on. Upcoming Event Notifications (event reminders) are set up through the existing Messages System which can be found in WordPress admin > Event Espresso > Messages > Default Message Templates page. If you do not see them on the page, then try adjusting the pagination through Screen Options in the top right area of your screen. Increase the value to a higher number such as 25 and then click on the Apply button to save changes. Please note: if the new message templates (shown in the screenshot above) are missing, then please make sure the Email messengers are active in Event Espresso > Messages > Settings. In this message type, the automation is triggered by the threshold against the earliest date-time on the event. This is ideal if you have an event with multiple (or single) datetimes but want to send out the notifications for just the event. In this message type, the automation is triggered by the threshold against specific date-times as opposed to individual events, which is ideal for when you are using an Event to represent multiple occurrences of that same event via datetimes. Visit the WordPress admin > Event Espresso > Messages > Default Message Templates page. Choose the message automated upcoming message type you want to work with (Upcoming Event or Upcoming Datetime) and click edit. Scroll down the page a little to find the Scheduling Settings meta box in the right area of the page, where you can turn the scheduling on and set the number of days before the event or datetime to send the automated notification. Once you have activated the scheduling, Event Espresso will email the registrants X days before the event. To activate the automated event reminders for a single event, visit the event editor for that event, then scroll towards the bottom of the page where you will find the Notifications panel. From there you can decide which upcoming notification (event or datetime) to send for that event, then click the Create New Custom button to create a custom automated notification for your event. Next, once you’ve created a custom template, click the Edit button. 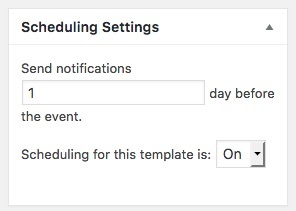 Then scroll down the page a little to find the Scheduling Settings meta box, where you can turn the scheduling on and set the number of days before the event (or datetime) to send the automated notification. 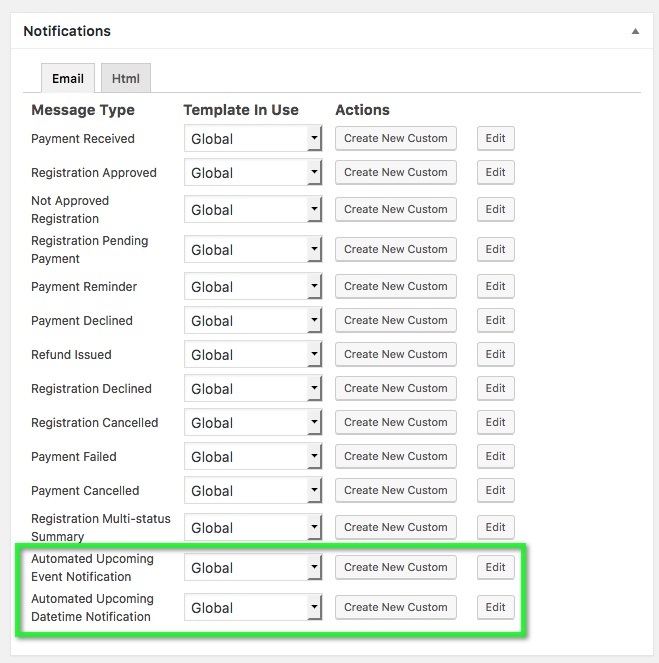 The “default” templates for these message types apply globally to all events but have a toggle for turning the messages off or on globally, which ensures that if you have a more simple setup, where you just want the same template to be used across all of your events/datetimes. You can just toggle the default template on or off. Please note: the setting defaults to off because having both on means registrants would receive multiple “upcoming” notifications for the first datetime on an event. By default, the message types will be sent to the contact details for registrants (only one email per contact, regardless of registrations sharing that contact) and would only get sent to APPROVED registrants. Event specific templates can be created that will override the default and would also have an on/off toggle for the message type. The ONLY option (besides the on/off toggle) for these message types is how many days before the event/datetime (depending on message type) the messages get generated and sent. This will only send to approved registrations for Events that are “upcoming” or “sold out” active status. The actual query will be based on whether there’s a date in the future for an event (matching whatever optional – the only option – threshold people pick.). For the upcoming event message type (not the upcoming datetime), there will only be ONE message go out and it will get triggered against the earliest datetime for that event. The shortcodes available for the templates will be the same as the registration message types because the recipients are registrations. Are you running a current version of Event Espresso 4? This add-on needs at least version 4.9.39.p to activate. If you have ever experienced email deliverability issues with your server, or are on shared/inexpensive hosting, or emails are getting lost or marked as SPAM or junk mail? Then a transactional email service is HIGHLY recommended when using this add-on for Event Espresso 4. This add-on uses Cron tasks to run scheduled callbacks or spawn cron for all scheduled events. This means that you will need a server that is capable of running Cron jobs (a unix program which runs unattended scheduled tasks).